Mandalay has been for a long time a royal capital for the region considered as Upper Burma capital. The name ‘Mandalay’ is one of the most evocative for Myanmar, mainly due to the famous poem by Rudyard Kipling. The first impression might be disappointing as the city is a modern town of concrete, rebuilt following heavy destruction by Japanese raids during World War II. 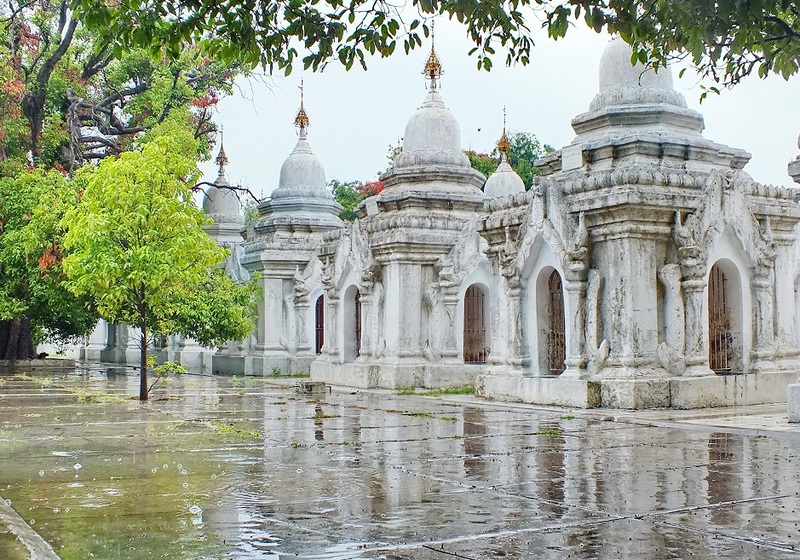 However, Mandalay still retains many historical sightseeing places with old temples and monasteries to be found in its surroundings. 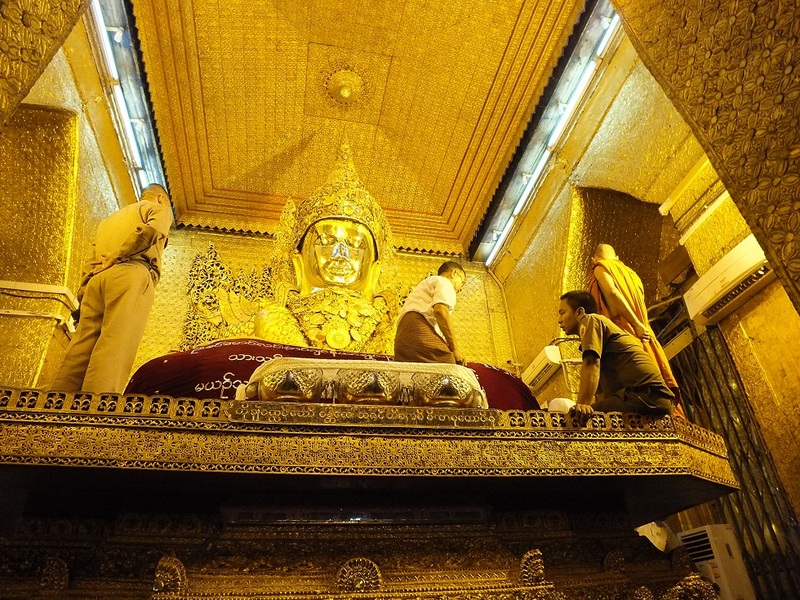 Mandalay is easily accessible from the rest of Myanmar by express buses, railways or plane. To best embrace town, start with Mandalay Hill. Located 10 km away northeast of Mandalay Rail Station, the 240-m high hill stands over the town. The top is crowned by Sutaungpyei Pagoda from which they are stunning views of the town and surrounding hills covered by numerous stupas. People mostly enjoy the sunset there. Go there: 20 minutes by taxi from Mandalay city centre in the Northeast direction. Kuthodaw (Royal Merit) pagoda lies at the foot of Mandalay Hill and was built in 1857 and completed in 1868. The structure was part of the creation of new capital by King Mindon. The stupa which is gilded above its terraces is 57 m high and was inspired by the Shwezigon Pagoda in Bagan. Most impressive within the pagoda compound are 730 stone-inscription caves, looking like a small stupa. Each contains a page of text from the Tripitaka, a Buddhist holy book, carved in a marble slab inscribed on both sides. The total number of stones carrying the book explains why it is the largest in the world. The site is listed on UNESCO World Heritage List. 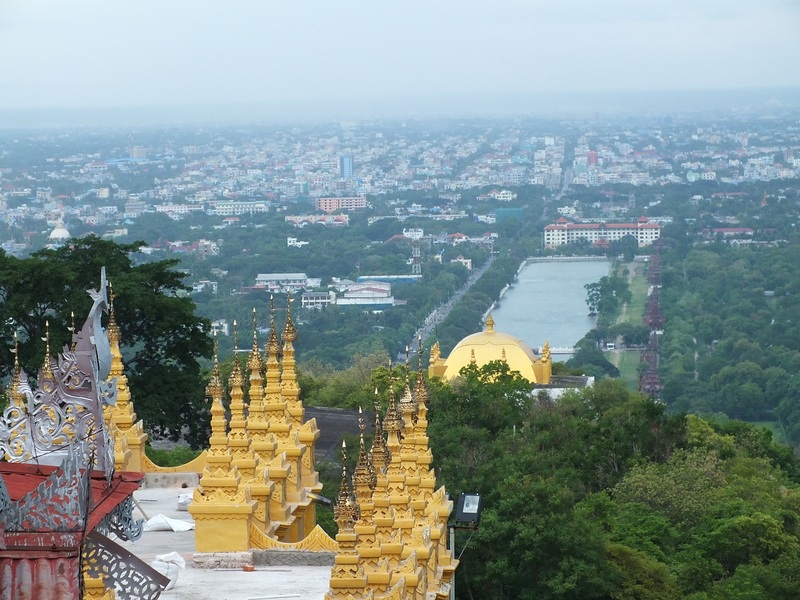 Go there: Kuthodaw pagoda is located halfway between Mandalay Hill and Mandalay Palace. It is located 10 minutes away by taxi from the palace. Mandalay Palace used to be the last residence of Burmese Monarchy before the country became a British colony. The palace was built between 1857 and 1859 during the reign of King Mindon and is formed by royal pavilions and halls as well as pagodas surrounding by a walled fort and a moat. Most of the palace compound was destroyed during WWII except for a watchtower and the royal mint. However, a replica of all other buildings, made in traditional style, was done during the 1990s, turning the palace again into a major attraction for both locals and tourists. Most spectacular are the Great Audience Hall and the Glass Palace, previously the King’s private apartments while Shwenandaw Kyaung is a perfectly preserved monastery made from teak wood. Go there: The pagoda is located 4 km north from the city centre with the possibility to go by taxis. Although being built only in 1895, the monastery is one of the few traditional Burmese pagodas in Mandalay to have to survive destructions in WWII. The monastery was ordered by Chinese jade stones merchants and is made up of teakwood crowned by tiered roofs while its interior is made of delicate wood carvings. The monastery still accommodates today some 35 monks and novices. 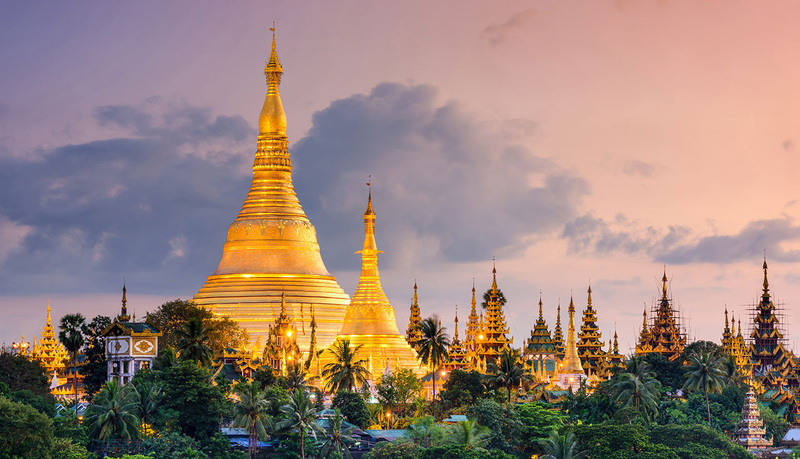 Further north to the monastery is the Ein Daw Yar Pagoda, a very photogenic structure with its 35-m high golden stupa surrounded by immaculate white walls. The pagoda The pagoda was built by King Pagan Min in 1847 and houses a Buddha statue that was brought from India in 1839. Go there: Shwe In Bin Monastery is located 3.5 km east of the Rail Station along the Thinga Yazaar Channel while Ein Daw Yar Pagoda is located on 89th Street. Mahamuni pagoda is where devotion of Burmese people is the most colourful and lively in Mandalay. Every day, hundreds of locals and tourists come to enjoy the rituals conducted by pilgrims and the monks living in the monastery. Every morning at 4 am or 4:30 am, monks wash the face and brush the teeth of the Buddha image, performed for over an hour. The face is washed with fresh towels, followed by the cleaning of the teeth with a large brush. The ritual finishes by applying sandalwood paste to the image and then cleaned with towels and sprinkled with scented water. Go there: Mahamuni Pagoda is located south of Mandalay rail station, a 15-minute ride by taxi. The pagoda is also located close to Mandalay Aung Pin Le rail station. 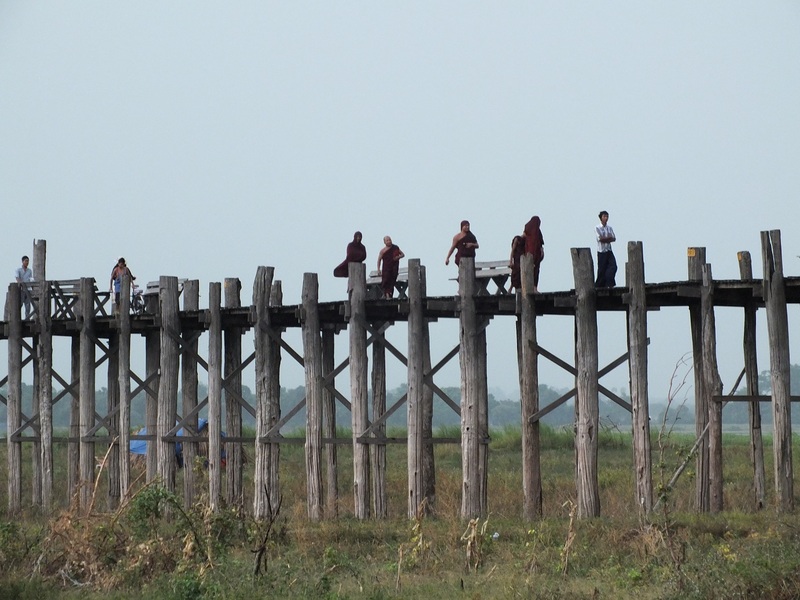 The bridge is the longest teakwood bridge in the world, spanning 1.2 km over Taungthaman Lake near the old site of Amarapura. Construction started around 1850 and is an important passageway for locals and a beloved photographic motive for tourists. It is particularly busy during July and August when the lake is at its highest. The bridge was built from wood reclaimed from a former royal palace. It has a slightly curved shape in the middle to resist the assault of wind and water and stands on 1,086 pillars. Go there: U-Bein bridge is located 13 km south of Mandalay Rail Station in the city centre and is easily accessible by taxi. Saigang has been a religious pilgrimage centre for centuries. 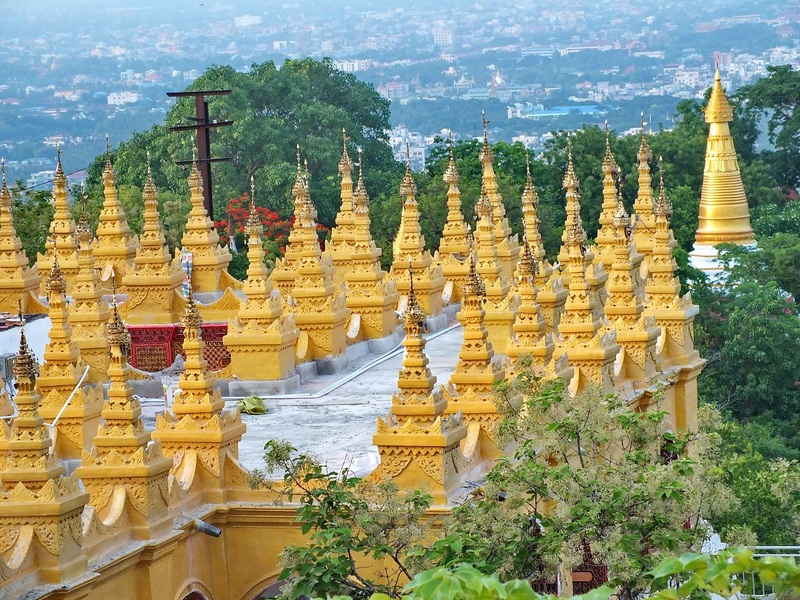 Located on a string of hills, Sagaing is “sprinkled” with monasteries crowned by gold or white stupas. The hill is located at the tip of the Irrawaddy river with fabulous views over the vast plain. Kaunghmudaw Pagoda is distinctive from other temples due to its distinctive architecture. Construction lasted from 1636 to 1648 and is inspired by Ceylonese temples. The pagoda is characterised by a large round dome with a circumference of 274 meters. The pagoda is 46 metres with its lowest terrace decorated with 120 nats (spirits) and devas (deities) and surrounded by 802 stone lanterns, carved with inscriptions of Buddha’s life. Go there: Sagaing is located 25 km away southwest of Mandalay. It takes an hour to reach the area by car. There is a sharp contrast between the hectic life of Mandalay and the charming rural laid-back atmosphere of Inwa (also named Ava), despite the fact that both cities are just 35 km apart. Inwa was Upper Burma royal capital from 1364 until 1841 when the capital was moved to Amarapura and then Mandalay. Inwa is a gathering of abandoned palaces and monasteries in a peaceful environment only troubled by horse carts and buffalos. 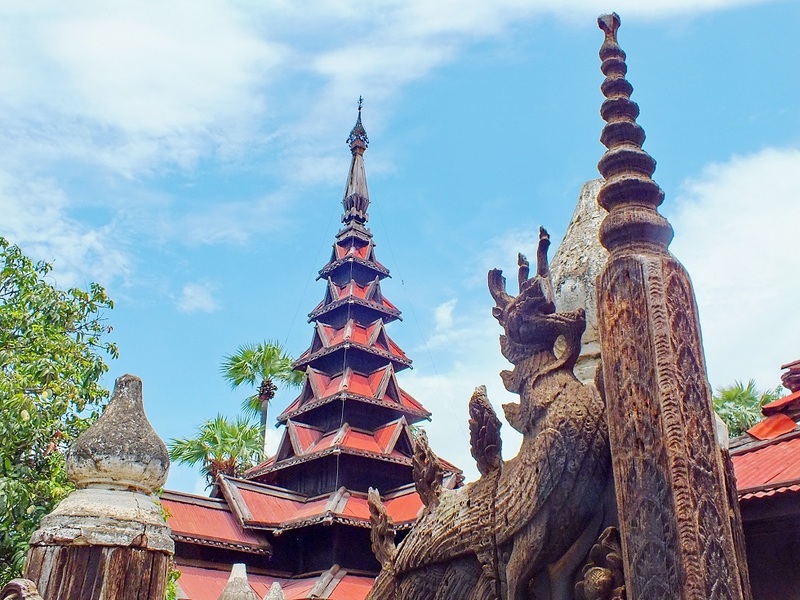 Among the most beautiful monuments to discover are Bagay Kyaung, a teakwood monastery built on 267 teak posts with walls and doors ornate with stunning carving. It also accommodates a school for novices inside its compound. Nearby is the Maha Aungmye Bozan, an 1822 royal monastery made of carved stucco, which over times has turned into a faded yellow, a very attractive motive for pictures. 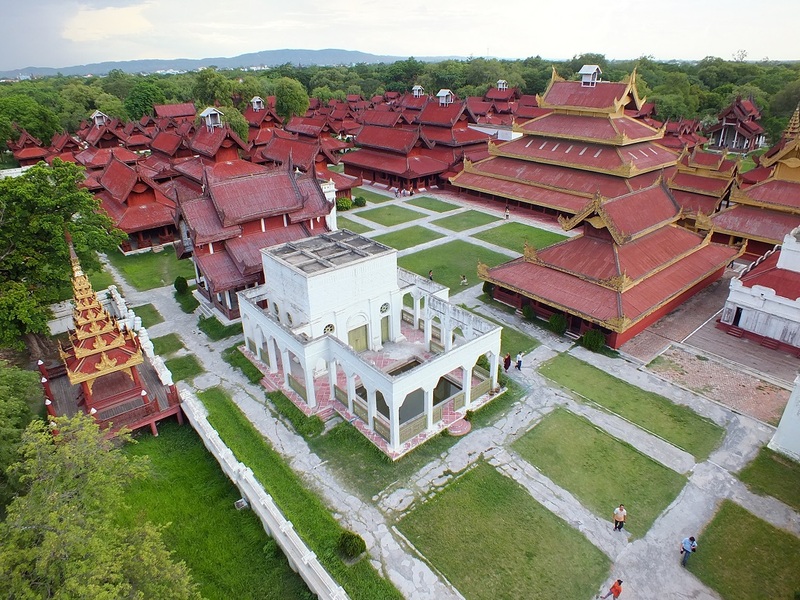 The monastery was built by Queen Nanmadaw Me Nu to serve as the residence for her religious teacher. Go there: an hour away by car southeast from the city centre of Mandalay along the Irrawaddy River. Need to refresh for a day? 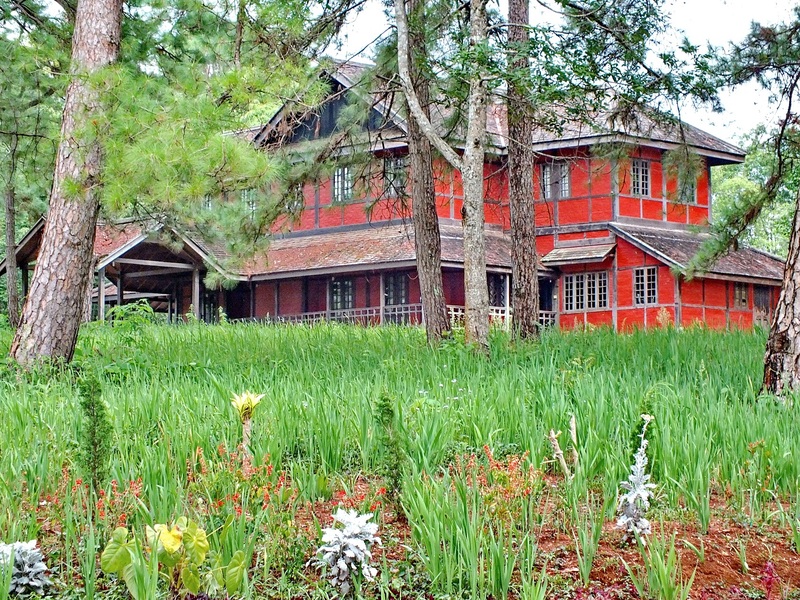 70 km away from Mandalay – the equivalent of an hour and a half to two hours ride- is the charming hill resort station of Pyin Oo Lwin, known during the British time as Maymyo. With its cool climate, Pyin Oo Lwin was considered the summer capital of British Burma with the Governor and the administration residing there during the hottest months of the year. The city has preserved a high number of colonial villas in Edwardian or Victorian style, inspired by British Tudor and has its fair shares of churches, colleges, and convents. Worth visiting are the Governor’s Palace as well as Kandawgyi Botanical Gardens. Created in 1915, the garden contains over 500 species of trees and plants. How to get to Mandalay? 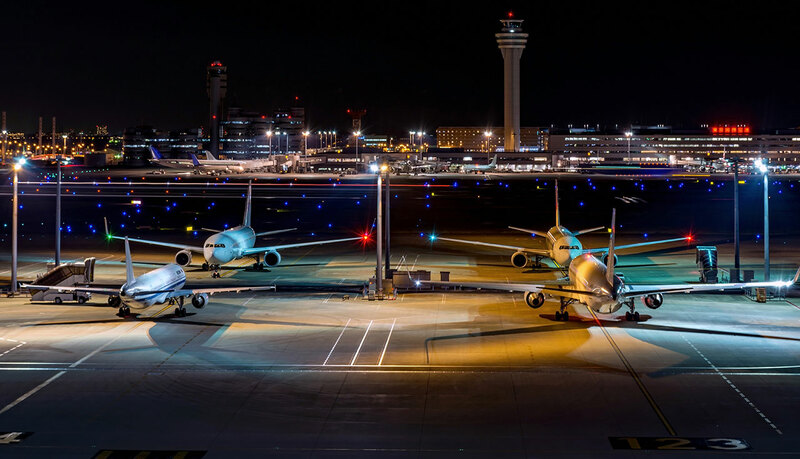 The easiest way to get to Mandalay is flying. There are regular domestic flights routes connecting Mandalay with Yangon, Taunggyi, and other local destinations. From abroad, travellers can take international flights to Mandalay from Bangkok and Chiang Mai in Thailand. Alternatively, you can book online bus tickets to get from other cities in Myanmar to Mandalay. Baolau integrates domestic and international flights to Myanmar to service online ticket booking to Mandalay in advance. Once the reservation is confirmed, customers will receive an electronic voucher that can be used to check-in and collect the physical ticket at the station of any departure point.